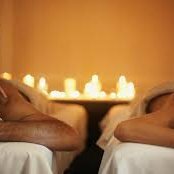 Share a loving 60 min relaxing massage with a loved one or friend. Massage can reduce stress and muscle tension, improve circulation, eliminate stiffness and soreness, boost the immune system, reduce pain and even help control one's blood pressure. Couples who strive to practice a healthy lifestyle can enjoy these benefits and more together.